If you've ever tried to lose weight, you've probably heard about at least one version of the grapefruit diet. The grapefruit juice and apple cider vinegar diet is one that claims to help you shed pounds quickly. As with many other fad diets, pros and cons exist. Drink 1 cup of grapefruit juice mixed with 2 tablespoons of apple cider vinegar before meals. Cut calories by eating as few as 800 calories daily to lose 10 pounds in just 10 to 12 days -- count calories with an app or food diary. Cut back on sugar and carbs (sweets, sugary drinks, white bread, pasta, white rice, bagels, cereal, pastries, potatoes, etc.). Boost protein intake -- eat more lean meats, poultry, seafood, egg whites, nonfat Greek yogurt, low-fat cottage cheese, tofu, seitan, and low-calorie protein shakes. Many people can lose weight by drinking grapefruit juice mixed with apple cider vinegar before meals, because this combination helps fill you up and only contains about 100 calories per cup. Likewise, if you're lowering your intake to 800 to 1,200 calories daily while on the diet, you'll surely shed pounds. However, drinking grapefruit juice mixed with cider vinegar isn't a guarantee you'll lose weight, and it won't work if you don't reduce your overall calorie intake. While one 2014 study found eating grapefruit is associated with lower body weight and waist circumference, another 2012 study reports grapefruit doesn't significantly lower body weight. More research is needed to determine apple cider vinegar's effects on body weight. 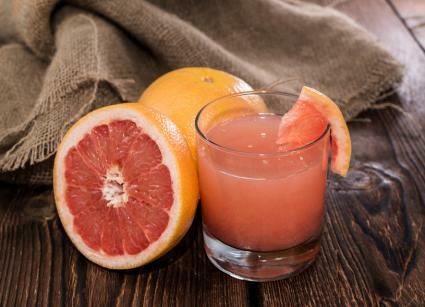 If you love grapefruit juice, this diet may be for you. It can help you control your calorie intake without feeling as hungry, especially if you boost protein. You can lose a significant amount of weight if you follow the diet correctly, which can lower chronic disease risks if you're overweight or obese. Furthermore, drinking lots of water and cutting sugar intake, as recommended by most versions of the diet, is a good habit to get into and maintain long term. While you may lose weight on this diet if you reduce calories, several drawbacks exist. The taste of grapefruit juice mixed with vinegar may not be desirable for you, and can even damage your teeth. One 2012 study found apple cider vinegar appears to cause tooth erosion when you drink it daily. If your total calorie intake drops below 1,200 per day, you should be monitored by a healthcare provider -- which isn't always convenient. Furthermore, grapefruit juice can negatively interact with certain medications, notes the U.S. Food and Drug Administration. There are several side effects to watch out for when following this type of diet. Tooth erosion is a main concern when drinking grapefruit juice with apple cider vinegar on a regular basis. Drinking too much of this mixture can also cause gas and bloating -- and heartburn if you have gastroesophageal reflux disease (GERD). If you're drinking grapefruit juice instead of fiber-rich fresh fruits or vegetables, you might experience constipation. If you're eating as few as 800 calories daily, which is considered a very low-calorie diet (VLCD), you run the risk of additional side effects associated with VLCDs -- such as fatigue, nausea, diarrhea, constipation, and gallstones. This diet may help you lose weight but only if you reduce your overall calorie intake. Always check with your doctor if you're taking medications as grapefruit can reduce the effectiveness of certain medications. Ask for medical supervision if your diet drops below 1,200 calories per day. The bottom line is you don't have to follow this diet to lose weight, and healthier, longer-lasting diet alternatives are available with fewer risks and side effects.